(Reuters) - The White House on Friday stepped up efforts to slow the flow of illegal children into the country, expanding the government's ability to process and deport people and announcing new funding to boost security in crime-plagued Central American countries. The Obama administration said it would boost the ranks of immigration judges, lawyers and asylum officers to quickly decide what happens to people apprehended at the border and to return them to their home countries. "We are surging resources to increase our capacity to detain individuals and adults with children, and to handle immigration court hearings," Homeland Security Deputy Director Alejandro Mayorkas told reporters. "This will allow Immigration and Customs Enforcement - or ICE - to return unlawful migrants from Central America who are ordered removed to their home countries more quickly," he said. Officials further announced $9.6 million in additional support to El Salvador, Guatemala and Honduras to help them receive and reintegrate people who are sent back. In an effort to address the causes of flight from Central America, the administration said it would launch a $40 million program to improve security in Guatemala and a $25 million program to provide services to youth in El Salvador who are vulnerable to organized crime. Washington has scrambled to address a flood of children arriving illegally at the border causing President Barack Obama has called an urgent humanitarian crisis. 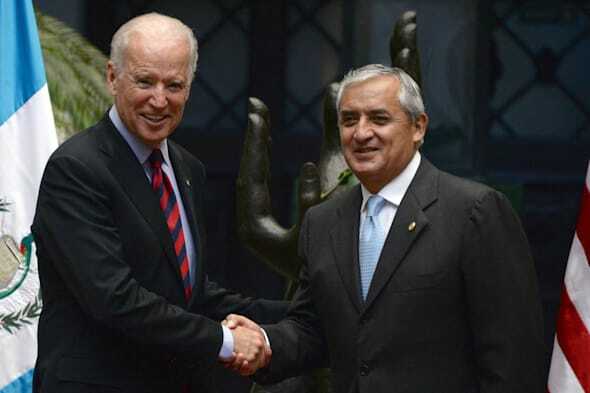 The president took the issue up on Thursday with Mexican President Enrique Pena Nieto, while Vice President Joe Biden was in Guatemala on Friday to discuss the problem with Central American leaders. "You're clearly not going to send a child back to a circumstance where there is no one there for them," Biden said. "But we do intend, and everyone agreed, it is necessary to put them back in the hands of a parent in the country from which they came." Cecilia Munoz, the White House domestic policy director, said that some of Friday's measures were designed to help Central American countries stem the migration. Efforts aim to "deal with the misinformation that is being deliberately planted by criminal organizations, by smuggling networks, about what people can expect when they come to the United States," she told reporters. From October to June 15, 52,000 unaccompanied children arrived on the U.S. border with Mexico, Mayorkas said. DHS is looking for more facilities to house the minors, he said. Republicans blame the influx of children on Obama's 2012 decision to give temporary relief from deportation to some young people brought to the United States illegally by their parents. House of Representatives Speaker John Boehner urged Obama on Friday to deploy the National Guard to handle the children and relieve the taxed Border Patrol. The White House's Earnest rejected that idea, saying there are already "significant enforcement resources" deployed along the border. Democratic Congressman Luis V. Gutiérrez further criticized the National Guard idea as "a naïve and aggressive knee-jerk reaction that is completely inappropriate in these circumstances."